reloading 30-06 , max shell leanth is suppose to be 3.340, doesn,t seem right. found an old milatary round and it,s 3.160. is there a minamum that there are suppose to be? First of all what gr and what type and what manufacturers bullet are you loading? Gidday Bramon...welcome aboard mate...grab a beer and pull up a stump. When you say max shell length...are you talking about a loaded round, or an empty case? 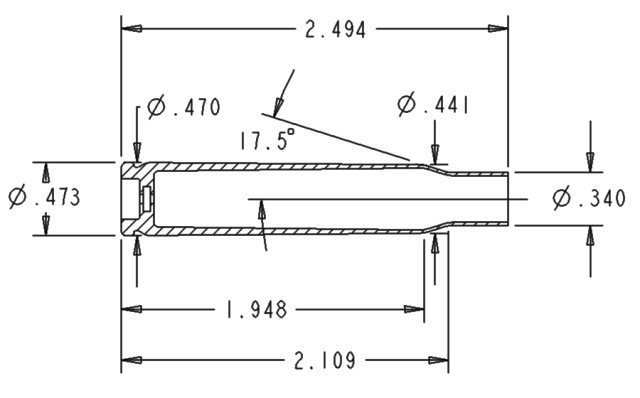 Here are some .30-06 specifications maximum case length 2.494", maximum COL 3.34". Ah-ha...Same bullet I use in my Browning A-bolt. Sierra 165 grain BTHP. My OAL is 3.230. This seats them about .005 from the lands of my chamber. Did you get your "complimentary" beer? And did you get a comfortable stump to sit on? Are you close enough to the fire to stay warm and still hear all the wild stories? GOOD!! Welcome to our camp. Thanks Bushy, that was my point. I seat the 180 gr bullets I use in my 30-06 at 3.300. Glad we are on the same page there 1895zzzzz. I seat my 180 grain Sierra BTSP to 3.325. Well damn!! Need a beer? Talk to Vince. He's the "Beermeister" here. Bushy, You like them Sierra bullets don't you? Once I have used a sierra bullet and never since. I used 117 gr SBT Gameking Sierra bullets once in my 25-06 and shot an Antelope at 300 yrds and it ran off like I had missed. From where I shot it I could could see it running for about a mile and then lost sight of it. Being a sportsman I checked where it was when I shot and couldn't find any sign of blood so I walked to where I had last seen it and there it was about 100 yrds away dead. I had hit it right through both lungs and missed the heart by fractions. The damage to the lungs was minimal and the bullet stopped at the ribs on the far side, no exit. After that I pulled all the game kings and loaded 117 gr BTSP or 120 gr HP Hornady and have never had a problem taking down Mule Deer, Whitetails or Antelope. Damn...is the Esky empty again...no problems...will fix. Hey Slim...you hookin' into the suds again mate... No problems...just let me know when stocks are runnin' low mate. This is an interesting topic. When I use a dummy round to figure the max col in my .30-06 it is 3.449. No why can I load a round into the magizine at that length. I have found 3.367 to be the sweet spot for my rifle with 56gr of IMR 4350. So do the math and you'll see I am quite a bit of the riflings, but shot a 200 yard MOA today. I think I will stick with that now. And then you have my 80 yard shot at a mule deer with a Sierra 180 grain BTSP that stopped it in its tracks. I guess it ran about 10 yards and collapsed. I DID take out both lungs and blew the heart to smitherenes. Actually 1895ss. One can not predict just what each individual bullet will do.